We do get to throw our leg over some pretty blue-groovy motorcycles here at Cycle World (the Gregg’s Customs R1 comes to mind), but even that seems a bit tame compared to the Ducati Desmosedici Street Tracker Roland Sands cooked up. (Matter of fact, the Gregg’s bike helped inspire the Desmo.) When we got wind of this build, a little persistent pressure got us in on the ground floor—that and the fact that Roland and yours truly go way back into the mists of the early ’90s at Willow Springs, and share an addiction for sideways cycling. We had high hopes of rolling the bike out for its debut at the Indy Mile this past August, but that race was, sadly, cancelled, and a more modest plan evolved to get in some laps at the classic Ventura County Raceway, right on the beach in SoCal. Seeing as how RSD went to all the trouble to make this bike road legal (and since that’s where owner Justyn Amstutz says he’ll be riding it a lot), I also took it for a little shakedown cruise on the street. 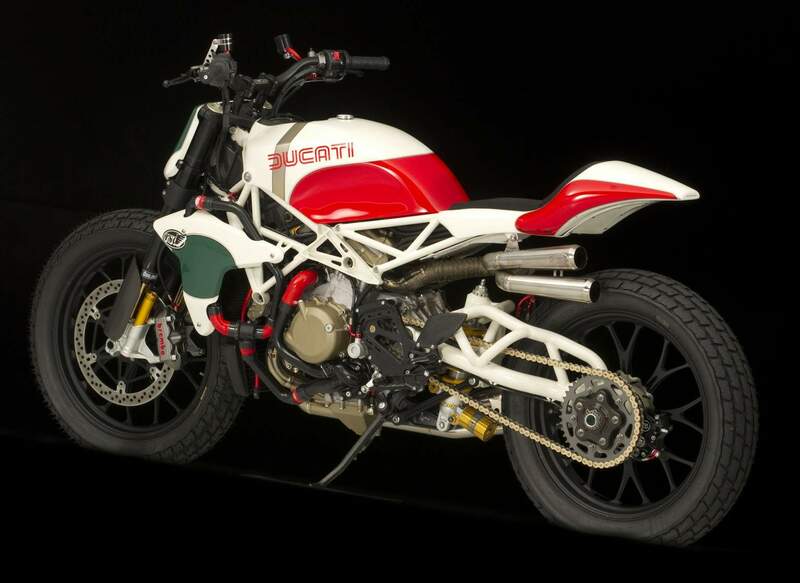 On public roads, this Ducati turns heads with its classic livery and outright UFO appeal—and it stretched my neck with its 990cc V-Four GP-bike performance. It stretched my ear canals too: The D16RR desmo scream echoing off Ventura’s coastal foothills raised quite a racket. (Hearing it from the patio of Rusty’s Pizza on Main Street below, lucky owner Amstutz, builders Roland Sands and “Welding” Rodney Aguiar, and Thirdwheel John Burns would’ve sworn there was some sort of offshore powerboat race going on if they hadn’t known better.) Dirty Duc’s midrange feels comparable to what your typical liter-bike makes at peak, and it just keeps building till 14,200 rpm. If you were waiting for the rev limiter to arrest-hook your wheelie, it’s a good idea to have a back-up plan and your right foot covering the brake. On the other hand, thanks to upright ergos and the wide Fatbar, it’s comfortable to ride and easy to keep between the curbs around town; short-shifting keeps the decibels down to a dull roar no louder than a brace of open-piped Harleys. Hopping the 101 freeway to the Ventura Fairgrounds is a trip back in time—and it’s also time for the hard work to begin. 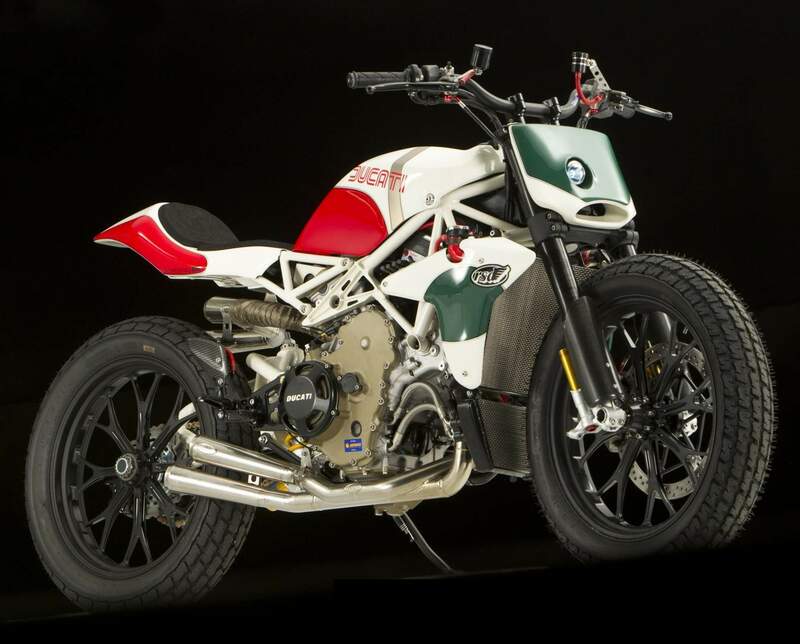 How will this untested $200k, 200-horsepower Duc of dirt work with a fraction of traction? The vision I’d been falling asleep to for weeks prior involved hucking the Duc into smooth dirt corners and letting those ponies eat their way grazefully out of the exits—but when we rolled up, the 1/5-mile oval was in sad shape, with a wavy surface and clay balls of various sizes, from pea to bowling, everywhere. But, okay, the photographers and crew were all there along with Roland and the others, so what was I gonna do? There’s a reason why the oldest bike in flat tracking (H-D XR-750) is usually the best; these things take years to develop, and it’s very much not all about horsepower. With very little flywheel, enough power for two very stout flat-track bikes, suspension on its maiden voyage and a track like a marble factory killing floor, the bike was a handful and I’m amazed I made it around as many laps as I did. And that’s all I’ve got to say about that. On a bigger, faster, perfectly prepped track like the Indy or Springfield Mile, it might’ve been a different, more graceful story. But cooped up on Ventura’s treacherous short track, Desmo D’s massive potential, I’m sad to admit, went mostly untapped. Having said that, the show must go on, and I did give the bird my best shot.